We are the prime Manufacturer, Exporter and Supplier of Agitator Mixer Seals in India. The product range is prepared as per the industry norms and widely demanded in various industrial applications. Owing to equipped with the latest technology, we are capable to provide Agitator Mixer Seals in customized specifications, defined by buyers. Description : “Agitator Mechanical Seals" are top entry agitator double mechanical seal designed for medium to high pressure applications. These seal are successfully used for many years in all kind of mixer, reactors, paints and pulps etc. these seals can be easily installed without disturbing the delicase mating faces. 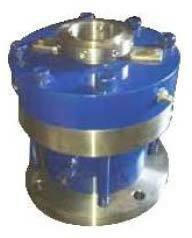 Used in top entry mixer vessels in pharmaceuticals & chemical industries.